Elm Identification: Click here for a handy guide from the lovely people at the Natural History Museum. Since 1997 we have been working to counteract the impact of dutch elm disease on the Island’s landscape (particularly the AONB) and biodiversity (especially the elm-feeding butterfly the white letter hairstreak Satyrium w-album). The initial sanitation programme attempted to fell and burn infected timber to slow and then halt the progress of infection; this was rendered impossible by frequent movements of infected logs through firewood sales. 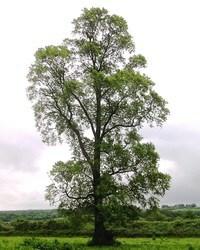 Instead Gift to Nature worked with British Butterfly Conservation and Southampton University to source resistant elms which could replace both the landscape feature of the lost trees and suitable habitat for elm-feeding invertebrates. 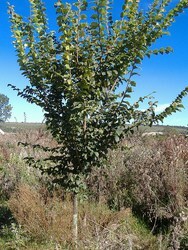 The chosen tree, UlmusLUTECE was then imported from France at 1000 trees a year for three years and planted out on our sites, farms, school grounds, public parks, incorporated into Defra and Forestry Commission planting schemes and sold in small numbers to private individuals to contribute to the costs of the next order. We have continued to work with AONB and BBC to source new resistant varieties and this has led to an order for Sapporo Autumn Gold this winter. These trees are paid for through an agreement between Gift to Nature and Vestas Technology whereby a resistant elm is planted for every new employee taken on at their Island base. 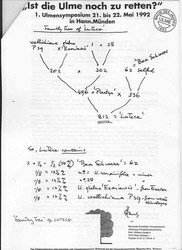 On the right is the plant breeder’s chart for LUTECE – a real Wych Elm that is totally resistant and supports a native elm fauna (top of our list being White-letter Hairstreak). There are elms out there sold and marketed as resistant but few really are, most are just unpalatable to the beetle that carries the disease and most of those are so alien to our native wildlife that they don’t do a lot except sit there. But LUTECE is brilliant; it’s been researched by British Butterfly Conservation specifically for WLH conservation and we’ve been planting out across the Isle of Wight. We’ve distributed over 3000 now and the earliest of the plantings are really beginning to show up in the landscape.